• They Are New – A new car is likely to suffer fewer problems than a used car. Since second-hand cars have already been in use for years, they are likely to give you more trouble. Therefore, many consider buying a new car a much better option. • Low Interest Rates – The costs of buying a new car may be high but many dealerships have introduced offers and deals that allow you to purchase a car at the lowest interest rates. However, this completely depends on your credit situation. • Warranties – New cars come with manufacturer’s warranties. Therefore, if you have purchased a car which is giving you trouble, you can always claim the warranty. Most vehicle manufacturers offer a three-year warranty and some vehicles may even come with a 10-year warranty. • Latest Technology – As time passes, new technologies and advancements are introduced. Therefore, new cars would be equipped with the latest technologies which could make life easier for you. For example, new cars now come with LCDs, MP3 players and other features, such as blue tooth( enabling hands free cellphone use), rear cameras, self-parking, collision avoidance systems, lane departure warnings and many other features. • Depreciation – It is estimated a car loses approximately 25% of its value as soon as you drive it off the lot. Therefore, in a few years’ time, the car will only be worth approximately 40% of its original value, and that is only if you have taken good care of it. • Insurance – All finance institutions and dealerships will need you to carry full coverage on your vehicle purchase until it is paid for completely. In addition, insurance premiums are based on several factors, including the age of the driver and the vehicle, and this means the newer the vehicle, the higher your premium will be. • No Return on Investment (ROI) – Since the vehicle loses approximately a quarter of its value, after you drive it off the lot, you will not make any profit on your investment. Sometimes, you may even pay more than the actual cost of the vehicle if the interest rate is high. The truth is, cars are really expensive. On the brighter side, if you purchase a used car, you may be able to save a significant amount of money. While many may consider buying a used car to be a rather bad decision, they do have a lot to offer and are perhaps the best option for budget conscious buyers and people looking to purchase a car with bad credit. • Lower Price Tag – Since second-hand cars have been used before, they come with a significantly lower price tag as compared to new cars. If you choose a used car with a good engine, eye-catching appearance and is in good condition, you may not even feel the difference between a new or used car. • Less Depreciation – A new car loses a significant part of its value as soon as you drive it off the lot. Therefore, if you’re the second buyer, you may be able to save a significant amount of money without having to worry about sacrificing quality. • Less or No Sales Tax – When you buy a new car, dealers usually add sales tax to the price of the vehicle, which could exceed a thousand dollars. 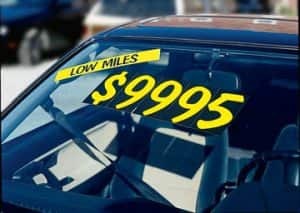 However, when you buy a used car, in some states you do not have to worry about paying sales tax, the laws of sales tax vary from state to state. In any case, the sales tax will obviously be lower on a used car. • No Warranty Coverage – When you buy a used car, you are not offered any warranty or guarantees. Therefore, if you face any problems with the car, you cannot contact the dealership or the private seller as there is no warranty to be claimed. There are warranties offered by third party services and by the dealer ( more expensive) at an additional cost so factor this in when looking at your total monthly payment. • Poor Condition – Used car owners can fool you easily. The cars may have a good appearance or look in good condition, but they may have many problems which you may not know about and may end up costing you more in the long run. Of course you can protect yourself by having a carfax vehicle history report and make sure you know exactly what you are buying. To conclude, it can be said that buying a used car is perhaps the best option for budget and value conscious buyers, and new cars are the best option for those looking for that new car smell with the latest model that includes a warranty.